The idea of using portable storage containers to store everything from household items and furniture to business records and building materials has been around for 30 years or so, revolutionizing the container industry. In the last decade, the idea really took hold and has become more commonplace. In the last few years, the idea really took off and has even become a hot trend. So much so that there are many different companies on the scene now offering mobile storage units to homeowners, businesses and construction companies who love the versatility and convenience they provide. However, A.B. 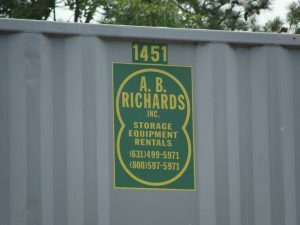 Richards was one of the first pioneers of portable storage units and has proudly been the go-to resource for customers seeking ground-level storage containers in the Northeast since 1982. Our storage containers come in three sizes: 20ft, 40ft or 40ft jumbo (hi-cube). Our 20ft containers offer approximately 25 percent more storage space than other comparable containers on the market. Our 40ft units feature even more storage space than that. We offer a variety of renting and leasing options. We deliver storage containers to your place of business, your construction site or your home, depending on your storage needs. Our storage containers are made of high-quality, 14-gauge stainless steel and have sturdy swing-out doors, making them secure, weatherproof and fireproof. Our on-site storage containers are more cost-effective than other means of storage, such as renting self-storage units or leasing commercial warehouse space. You can easily load, unload, organize, re-arrange and access anything you store in our containers right on site and never have to worry about running to a separate facility. Our knowledgeable sales staff of storage professionals answers any questions you might have and helps you select the right storage solution for your project or company. Our trained technical staff handles all aspects of storage container leasing, including unit preparation and inspection. Our qualified delivery staff provides courteous and efficient deliveries. To learn more about our portable storage options and join the ranks of our wide variety of container customers – from homeowners and construction foremen to department stores, restaurants, schools, sports teams, and arenas – contact A.B. Richards today at (800) 597-5971.